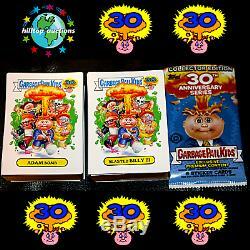 This listing is for a Garbage Pail Kids 30th Anniversary complete set of 220 cards from 2015. Note to all international buyers: I can mark this as a gift and put a low value if you want. Just make a note when you pay! We can no longer cancel orders once they have been paid for. The item "GARBAGE PAIL KIDS 30th ANNIVERSARY COMPLETE 220-CARD SET +WRAPPER 2015 free-ship" is in sale since Sunday, March 19, 2017. This item is in the category "Collectibles\Non-Sport Trading Cards\Garbage Pail Kids\Complete Trading Card Sets". The seller is "hilltop-auctions" and is located in Ansonia, Connecticut. This item can be shipped worldwide.